2 Bedroom Flat For Sale in Motherwell for Offers Over £130,000. 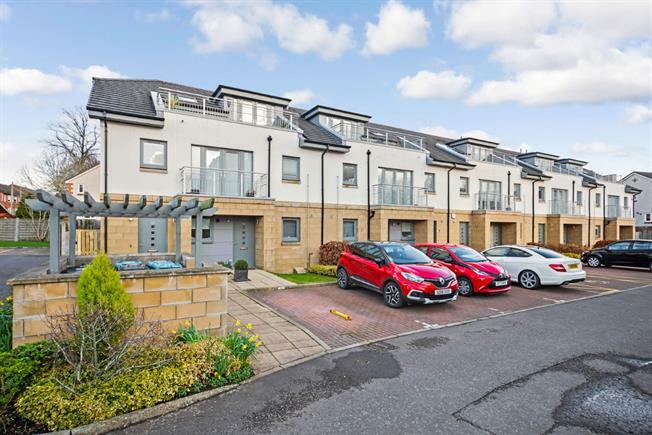 Seldom available modern garden flat within a locally admired Dundas built development. Offering an abundance of genuine on the level accommodation this apartment is sure to be of interest to a variety of buyers types including the down sizing market. The accommodation includes: private door access to a welcoming reception hall with storage, fabulous open plan lounge/dining room with quality fitted kitchen and French door access to the rear garden, two double bedrooms and stylish bathroom. The rear facing master bedroom is especially impressive with extensive fitted storage and en-suite facilities. Tasteful decoration is on offer throughout with the high specification finish including double glazing and gas central heating. The wonderful position offers private garden grounds which are mainly laid to lawn with a sun terrace built in timber decking. The flat also benefits from allocated car parking with further visitor spaces located within the courtyard. Internal viewing is essential to fully appreciate this impressive luxury apartment.